Capernaum made me think that we’re so privileged in the West: there are so many cultures in the world that haven’t had the safety and security -- on a national, local and personal level -- that many of us have experienced. Childhoods are stolen from children daily, but the reality is that we turn a blind eye to these issues because they don't always get the media exposure that is critical to our awareness. Yet director Nadine Labaki has tackled this issue by bringing real life into the cinema, creating a realist feature that harkens back to the likes of Abbas Kiarostami and Mohsen Makhmalbaf throughout the wave of Iranian realist cinema in the late 80s. This is clearly a passion project for the Lebanese actress and director, who has helmed three features prior to Capernaum -- here, she puts her own stamp on the difficulties of life for Lebanese citizens in Beirut. At first, I was skeptical as to why Zain (Zain Al Rafeea), a boy no older than 12, could have become so embittered at life, jailed for committing a violent crime and sentencing his parents to a court case in order to ‘divorce’ them, suing them for the crime of giving birth to him. But we see in flashbacks that his life has been so brutal that he’s defenseless, forced into survival mode to protect not only himself but his younger sister and other children too. They are for all intents and purposes alone in the world, and he has been forced into the role of father and protector, standing in for what they’ve been missing. A slow-burning epic that one expects to involve more of a court case and a trial, in fact it largely revolves around Zain’s episode caring for Ethiopian refugee Rahil's baby, rather than having much to do with his family issues at all. Some could suggest this makes the film’s publicity and synopsis misleading. Yet it’s more a story of his fraternal instinct towards baby Yonas and his sister Sahar, with the bookends of his parents’ trial as an addendum. They say a child’s first 7 years are the most important, and this film portrays Zain, clearly the victim of an unhappy childhood and severe negligence on his parents' part. The film opens with a court case, ludicrously instigated by the young boy, who already acts like a man and surprised me with his ability to fully inhabit the role of a protector to his siblings. I'm sure we're all wondering at the start: how can such a tiny boy be doing jail time? What kind of an inhumane society allows a child to grow up without the proper care? But it gets far worse. Labaki deliberately chose non-professional actors for the roles, in order to tell Zain's story as naturalistically as possible, closely paralleling their own lives. In particular, this realism is most evident when rapid editing at claustrophobic, close-up angles are employed, giving off a sense of suffocation in the oppressive atmosphere of the house. Predictably, Zain's younger sister is the first victim of their parents' seemingly irresponsible lives, chosen to be married off once she reaches the age of 11. It's an unfortunate, even sickening reality, but sadly part of life in the desperately poor and traditionalist area of Israel they inhabit. While it’s clear from the start that Sahar’s character is set up for trouble, the resulting consequences for herself and their family is a clear indictment of outdated traditionalism concerning child marriages. We can easily look at these rituals being alienated from the culture that instigates them, but it’s an important and often devastating part of life for many parts of the world. But just because we don’t see it happening here, doesn’t mean it's not happening at all. Escaping his parents' home after this transactional marriage, Zain boards a bus and heads to a neighboring town. Bizarrely, the gravity of the situation is undercut by his funny, sad encounter with an old man dressed as Cockroach Man -- ‘I’m Spider-Man’s cousin’, he says wearily. It's symptomatic of the state of the nation, after all: a faded pastiche of better times, the people left in decay when crumbling governments take a laissez-faire attitude towards the poor. Following Cockroach Man, Zain eventually meets an Ethiopian refugee, Rahil, and through her, he gains the mother figure and the family unit he’s always lacked. Trusted with the care of Rahil's infant son for the night, Zain finds himself unsure how to act in a paternal way that isn’t aggressively protective, having never seen it embodied. Yet after a while, he softens and is able to show and be shown love in return. It's almost as if to remind us that he is only 12 years old, just a child himself, who, under different circumstances, could have turned out to be so much happier. The only way to describe the rest of his encounter with Rahil's baby Yonas is 'heartbreaking'. It has to be seen to be believed. It's an unspeakably sad situation which words won't do justice, and I really do implore others to see it if they can on general release. There are a plethora of issues explored, from immigration (fiercely poignant with the exodus of refugees in recent years) to money laundering, prostitution to desperately inadequate housing for the poorest in Lebanese society. There is very little evidence of any wealthier classes or a government seeking to tackle these manifold problems: they are completely removed from the microcosm of the poor, and one gets the impression that people in the lower classes have simply learned to put up with these injustices. As has been widely reported, Capernaum is reminiscent of many different genres of filmmaking, from French and Iranian New Wave to the documentary style features of Andrea Arnold and Clio Barnard. It reminded me especially of The Breadwinner, set in Kabul in the early 2000s, exploring a young Muslim girl's plight and her mission to feed her family in extremely adverse conditions. It also brought to mind Abbas Kiarostami's Where Is The Friend’s House? which also utilizes amateur actors from the local area for a more naturalistic performance. Capernaum does seem to be set up for tragedy, but a lot of the violence is emotional rather than physical. It’s an indictment of the failed Lebanese legal and political systems, and at times its message seems heavy-handed, but even for its clumsiness, it makes clear that lives slip through the judicial cracks every day, and nobody in power is doing anything to make their issues visible. 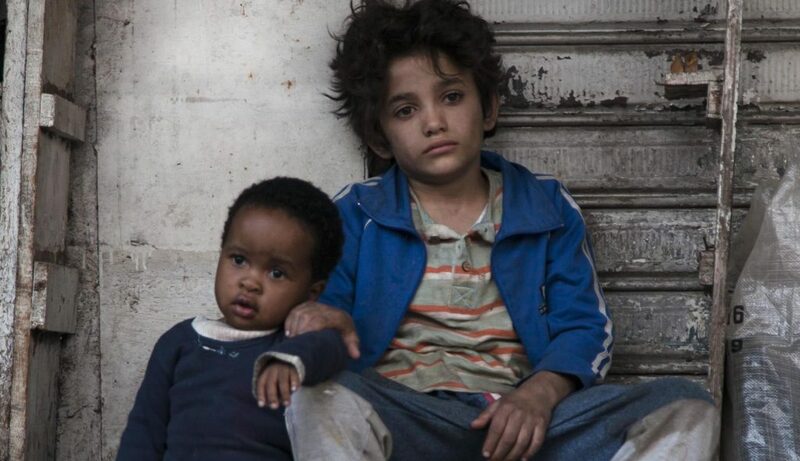 In that sense the film is drawing attention to itself as a polemical tool, calling out for justice in the allegorical Capernaum, meaning ‘chaos’ or ‘a mess far out of control’ - going beyond Biblical allusions of a city of miracles, it is instead translated into the breeding ground of extreme poverty and violence, and stands in as a representation of all marginalized people, Lebanese and of other nationalities. The framing device of the phone call from jail seems to be employed so that Zain can be a mouthpiece for the generation. Maybe it’s an overused cinematic tradition but it gets the message across clearly. The images of violence and neglect are almost like archive footage of the news, a window into what’s going on in the world. This is why films matter - because they are not purely escapism, but take us on other people’s journeys and show us what’s going on in real life. Will its message reach those so far culturally removed from its subject? This is a question of distribution, but even by existing in the media, Capernaum will certainly have an impact and serves to raise greater awareness of human rights issues in the Middle East.